archaeologyfieldwork.com - Artifact or Geofact? This piece of hard limestone was uncovered from about 20 cm down in dense and apparently undisturbed clay by a lady tilling for a new garden on a hillside in eastern Muskingum County, Ohio. What do you think? Artifact or geofact? Please explain your reasoning based on what you see in this composite photo. I'll respond after a reasonable number of you have replied. Thanks for your time. I would say geofact. I can't really see any sort of human changes to it. I see that there are some sort of scratches across it BUT from the photos I can't tell if it didn't just happen from natural processes or maybe from the lady tilling a new garden. I would say geofact. The striations on the notch look like tilling damage. Yes, the striations run both horizontally and vertically, but that could have happened if the piece was turned sideways by tilling. I don't see any other evidence of human handling. It occurred to me that I was remiss in not stating the dimensions of the rectangular area shown lower right in the photo. The width of this area is about nine millimeters, and the photo was taken under about 10X magnification. The surface is smooth, shiny, and well patinated along with calcite deposits. Under the binocular microscope with illumination at a low angle across the surface, the parallel and subperpendicular striations are seen to extend to a very shallow depth beneath the surface. You may want to consider all this with respect to the tilling damage hypothesis. Thanks, StarRider - interesting idea. From the information presented in my initial posting, which glaciation do you think is responsible for the striations on this stone? That would be difficult to say, as if it was found in "apparently undisturbed clay" then it's likely outwash. The patina in the magnified photo would suggest the striations have been there quite a while, but like the others I see no indication that they were caused by human action. Does this map, along with the find location given in my first posting, give you some further insight? Again, input from others in this forum is welcome and encouraged. Well after looking at that second photo, yes 99% geofact. I would like to hold it in my hands to be sure but until technology is there I will just stick to a 99% sure it's a geofact. As starider says, Glacial striations. Looks like something straight out of a publication someone gave me, Stone Effigies of the High Plains Hunters by James Gaskins. Hi DougRM and fresno... Sorry I'm a bit slow in replying - lots of other stuff going on. Doug, you figure we do actually have evidence of pre-Pleistocene glaciation here? Maybe so, since the 300,000,000-year-old Pennsylvanian sedimentary bedrock is just beneath the surface. And it seems this glacier took an unusual path, since the pretty much identical striations run nearly perpendicular to each other. Apparently the glacier came to a dead stop then took a hard left or right. Interesting... Also, since the stone in question is local limestone, it must not have been dragged very far for some reason. Fresno, you say "stone effigies"? Does the morphology of this stone suggest anything other than a random naturally abraded rock? Please explain if you would. Without knowing context it would be very hard to say. Rocks move. Is it undisturbed clay or is undisturbed clay after it was laid down by construction 20 years ago that came from somewhere else? Are there streams or other natural process that could have moved it? What is local limestone? What sort of area does it cover? Could it have come from somewhere else? I really don't have enough info to make any sort of claim other than the striping looks natural. Something that could easily have occured at pretty much anytime. I say glacial but it could be some animal or river causing the scrapping. Honestly, couldn't say more than it does not look like humans made scratches on it on purpose. Doug, thanks for your assessment. Quite likely this hard, dense, and rocky clay terrain was not disturbed within the historical time frame, given that the area was woodland relatively recently cleared for grazing. There's no stream on the hillside, but of course the stone could have slid downhill before it was covered. Anyway, after over a thousand views in a professional archaeologists' forum, we now have four proposed natural causes of the striations on the stone's polished surfaces: tilling, glacier, animal, and river. I'm rather surprised that two other stock explanations have not yet been presented: fossil and natural crystal structure. Would someone like to comment of either of these two possibilities? Will also have to go with geofact. Being found in a solid clay matrix, and all the other factors, like the the thin cortex developed over the striations, pretty much indicate any modifications to this piece of limestone happened long ago and were of natural origin. Most likely a combination of glacieral abrasion polished by time and sedimentary wash.
Ok, the professional verdict seems to be abrasion and polishing by cryptoglacial action, or possibly by some other unexplained natural force not involving a human. Before I take this any further, I wonder if any archaeologist here sees in this stone anything that might suggest to him/her that a human had a hand in this. (Hint: Fresno may have suggested something.) Thanks! The third picture shows a rhombohedral like planar structure to the material which is in turn reflected in the angles seen in the "bird" like features, then it just peters out to a disorganized structure. I don't remember from my geology classes which minerals exhibit this fracture property, but I don't recall any from school that were known to have been selected by prehistoric peoples. This may be able help you source which glacial till source it came from. Unless there is blood residue from where it was used to bludgeon something I am pretty sure it is non-cultural. I can see what the others are saying about the glacial scouring/ striations (pic 1), but again I do see a cross-pattern to the close up that is neither perpendicular or random in nature. AED wrote: Fresno, you say "stone effigies"? Does the morphology of this stone suggest anything other than a random naturally abraded rock? Please explain if you would. I think it is natural, as are all of the effigies in the book I mentioned. Out on field survey, I tend to come across a lot of "geofacts". I am usually skeptical about isolated findings. I might give yours more consideration if it was found among a scattering of obvious prehistoric artifacts. 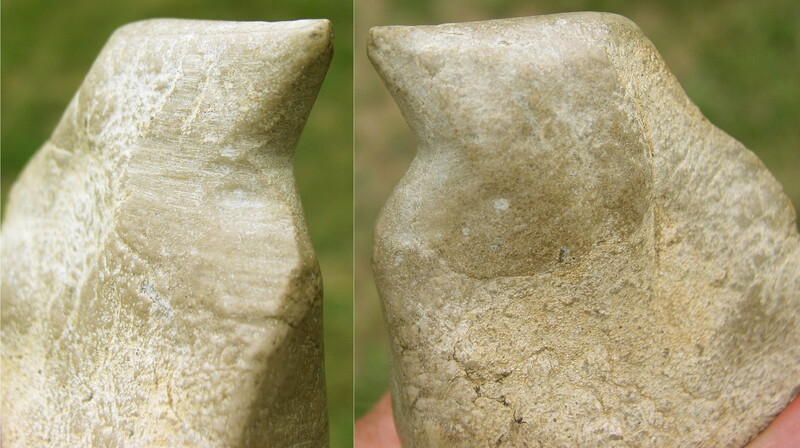 photos of Middle and Late Archaic figure stones. Nice! Middle Archaic. It was about 15 cm directly beneath an apparently Early Archaic point. resemblance is rather obvious, isn't it? I thought it might be interesting to run the piece past the archaeologists at the Ohio Historical Society, generally presumed to be Ohio's ultimate arbiter of artifact vs. geofact. They had been proclaiming on their website that anyone wondering about "the oddly shaped rock you found" should show it to them for a determination of whether it is an artifact or "just a rock", so I emailed them the same high-resolution photos. The quick response from the manager of that group: "I would speculate that the faceted surfaces and the parallel striations and smoothing were caused by the stone being embedded in glacial ice as it was dragged across the surface at the bottom (or along the side) of the glacier." And "Certainly I see no clear cut evidence of human modification in the images." 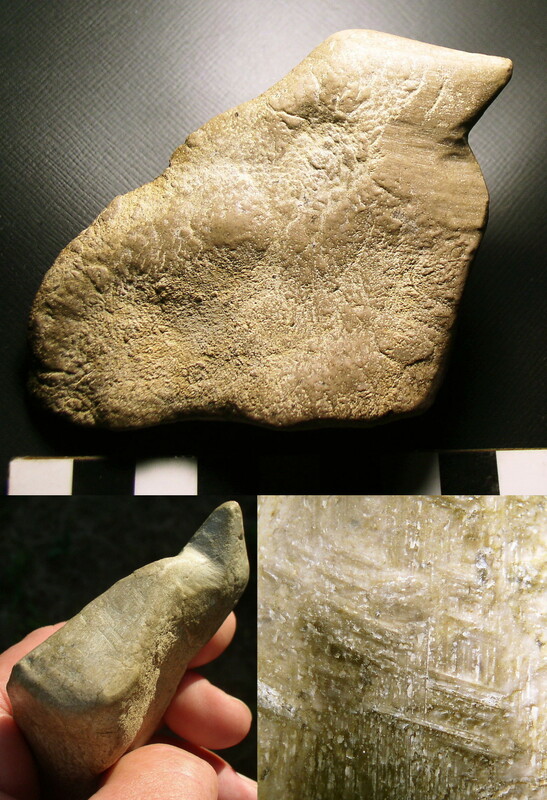 Another in the group, apparently aware of the absence of evidence of glaciation in the area of the find, stated "I would guess that the rock is naturally formed and what looks like striations are actually calcite crystals or crystalization. They intersect each other too close to have been made by abrasion." The other members of the staff concurred with the latter assessment. An offer to bring the stone to Columbus for in-person inspection was met with the reply "No value in examining it further." I then informed them that the professor would author a report confirming artifactuality, and that this would, upon request, be made available to them prior to publication so that they might address any technical errors it might contain. They declined the offer. “This small piece of limestone is micritic in nature, meaning that the calcite crystals in the rock average around 100 micrometers or less in diameter. This microscopic size rules out any possibility that the linear or facial features visible on this stone are the result of the mineral properties of calcite, such as cleavage traces or crystal faces. The second distinguishing feature of this stone is the polished facets. Indeed, the natural process most likely to have produced these polished faces would be glacial abrasion. 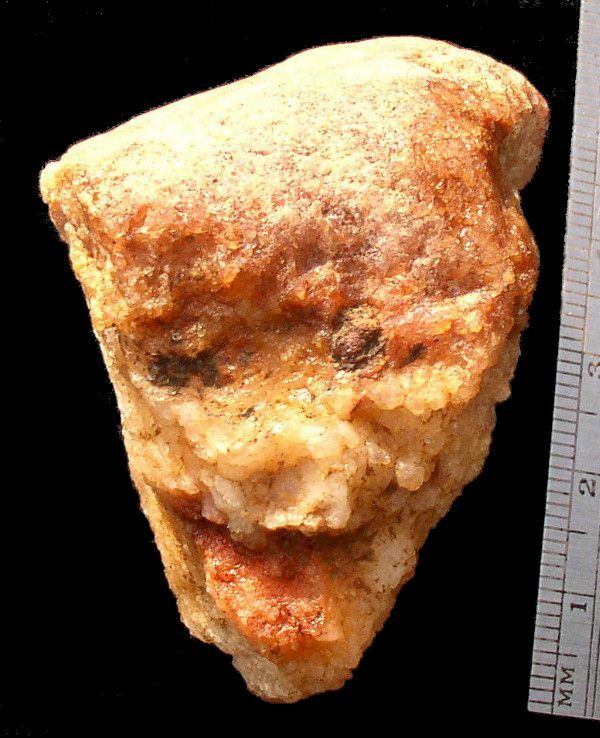 However, the most distinctive feature of this small rock is the apparent form of bird head/beak and neck, the features of which are confined to a cross-sectional area of about nine square centimeters. Within this small area, the rock was polished along at least four different directions in a 3D distribution, with interfacial angles ranging from about 40° to 120°. Glacial abrasion on rock normally progresses in only one straight linear direction, and its occurring in such a specific 3D geometry within such a small space would certainly be quite rare. In particular, such a rare case of polishing happening to shape the vivid image of bird head/beak and neck would be virtually miraculous. Of those viewing this piece in person, almost everyone has recognized it as an artifact. Notably, this includes archaeologist Richard M. Gramly and rock art specialist Robert G. Bednarik. The consensus is that the smooth polishing (with attendant striations) was likely accomplished with very fine-grained sandstone. Regarding fresno's accurate observation that context with "a scattering of obvious prehistoric artifacts", would support an assertion of artifactuality, the site has not been extensively "dug". Quite the contrary. Material recovered has been mostly at or just below the surface, and over very small areas. Being more or less aware of my limitations as a fumbling amateur, I do very little digging. But other material that has appeared includes nonlocal apparently Upper Mercer flint debitage, chunks of geologically anomalous limonite (yellow ochre), and likewise anomalous pieces of petrified wood (manuports?). Altogether, I would submit that since rock is the most enduring artifact material composing what our early predecessors left behind, a more technically knowledgeable understanding of geology and petrology than is typically evident among archaeologists (at least here in Ohio) is needed in identifying locations of ancient human habitation. Those people made a lot more than just flint implements and occasional museum-quality art. this reminds me of several of your old threads. Always interesting though AED, it at the least gets people to discuss topics, which seems lacking here nowadays. Hi Dwarmour - good to hear from you again! It's been quite a while. As I recall, your geology minor stood you in good stead in our various group discussions (using the term "discussions" a bit loosely in some instances...). You were just getting started in archaeology, I think, and if I remember correctly you found employment somewhere in the southeast. I sure hope things are going well for you. In recent years I haven't often ventured into forums, finding it more productive to focus on research and proper scientific verification of the material as time and money allow. But this forum in particular was quite informative on various levels. I've managed to get a few articles published, one of them coauthored with the aforementioned geology prof. More recently, I'm getting set up to render 3D visualization of aerial LiDAR data for a close look at the terrain here in southeastern Ohio, which the Wise Ones in Columbus quite wrongly insist holds little of archaeological interest. I have some sense of urgency about this, as the ground that has not already been chewed up by surface mining is now being attacked by the hydraulic fracturing people. Never a dull moment! Next topic: "ancient people STINK!!" Previous topic: "Moving of monolithic stone."